A turtle walk is a presentation on sea turtle biology and conservation followed by a guided walk on the beach at night to witness a nesting loggerhead sea turtle. In the summer of 2014, our walks will be at the Town of Indian River Shores.. Described by many as awe-inspiring, turtle walks are comprised of a presentation and then a trip to the beach to watch a nesting sea turtle. When – Friday and Saturday nights in June-July. Staff – Lead biologist, scout and guide. Flash photography and flashlights will not be allowed on the beach. It will be a late night so it is not recommended to bring young children who normally go to bed much earlier. We will respectfully ask everyone to be quiet throughout the walk. Individuals who have difficulty walking should contact us ahead of time and be aware that the turtle might be as far as 2/3 mile from the beach access. We begin with a presentation on sea turtle biology and conservation. The presentation will focus on the general biology of sea turtles and the reasons for their current threatened and endangered status. We will include a video showing what you can expect to see on a turtle walk as well as simple things you can do to help sea turtles survive. The Treasure Coast region of Florida, which includes Vero Beach, can also be called "Sea Turtle Central." Every year tens of thousands of loggerhead sea turtle nests are deposited on the beaches in this part of the state. During the presentation, our scouts will be looking for a nesting loggerhead to show the group. We may stop or prolong the presentation depending on the availability of a turtle that evening. In the event that the process is taking longer than expected, we will be showing the film "Turtle: The Incredible Journey," which chronicles the life of a loggerhead sea turtle from hatchling to adult. The centerpiece of every turtle walk is witnessing a loggerhead laying eggs. Our professional team will give you a high chance of seeing a turtle while doing our best not to spook other animals that may be nesting at the same time. Turtle walks are permitted through the Florida Fish and Wildlife Conservation Commission (FWC) and our lead biologist has over 20 years experience in sea turtle biology. Sea turtles go through a series of phases during their trek up the beach. 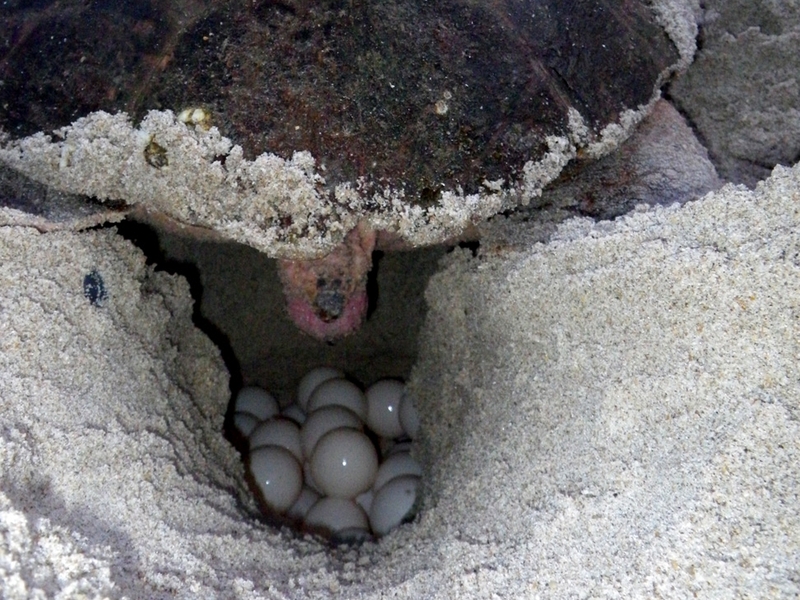 Because females may return to the water prior to nesting, we will be taking the group on the beach only when we are sure the turtle is depositing eggs. Beach conditions and weather will vary from night to night. Generally speaking, summer nights are warm and buggy. However, an onshore breeze usually keeps the insects at bay until midnight. We will not go out in heavy rain or a lighting storm, but we may go out on the beach in a light drizzle so be prepared. OUR 2015 TURTLE WALKS WILL BEGIN JUNE 12TH AND END ON JULY 25TH. THEY WILL BE EVERY OTHER WEEKEND IN JUNE AND JULY. PLEASE FOLLOW THE LINK BELOW TO REGISTER.